Image caption Tha dùil gun ruig an Loch Seaforth Grianag Dihaoine. Tha am bàt-aiseig ùr a bhios a' seòladh eadar Ulapul is Steòrnabhagh - an MV Loch Seaforth - mu dheireadh thall air a slighe a dh'Alba às a' Ghearmailt. Dh'fhàg an t-soitheach, a chosg £41.8m, gàradh Flensburg sa Ghearmailt madainn Dimàirt. Bha dùil an toiseach gum biodh i air an t-slighe eadar Leòdhas is Tìr Mòr anns an t-Samhradh, is an uair sin san t-Sultain. A bharrachd air an dàil sin, nochd an uair sin ceist mhòr mu dheidhinn na bha an dàn dhi aig toiseach an Damhair is gàradh Flensburg ann an staing ionmhais. Chaidh riochdairean bhon bhuidhinn CMAL, leis a bheil bàtaichean Chaledonian Mhic a' Bhriuthainn, dhan Ghearmailt is chaidh am bàta a chur nan làmhan gu h-oifigeil. Tha dùil gun ruig an Loch Seaforth Grianag Dihaoine. Chan urrainn dhi tòiseachadh air an t-slighe eadar Leòdhas is Tìr Mòr fhathast leis nach eil Caladh Steòrnabhaigh deiseil air a son aig an ìre seo. Tha àite air a' bhàta 'son 700 luchd-siubhail, 143 càr no 20 carbad coimearsalta. Chaidh an t-ainm MV Loch Seaforth a thaghadh às dèidh farpais a rinn CMAL air an làraich-lìn aca. 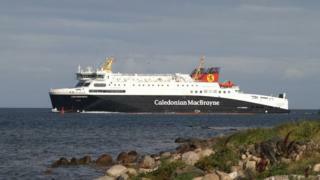 Bha roimhe bàta puist aig Mac a' Bruthainn fad iomadh bliadhna air an robh an t-ainm MV Loch Seaforth. Bha i a' seòladh eadar Steòrnabhagh, Caol Loch Aillse is Malaig eadar 1947 agus 1972. Chaidh i air na creagan mu dheireadh thall ann an 1973 nuair a bha i a' frithealadh air na h-Eileanan Beaga.